I’m always so impressed by Mrs. Molesworth. Not so much by her fantasy-tinged stuff for younger readers — the same grounded-ness that makes her other books so good drags her down there. But her more realistic books — mostly the ones for older girls — are so smart in such a light-handed, careful way, and even when I think I’m expecting it, I’m always a little surprised. They’re didactic — they’re very straightforwardly about learning to exist as a woman in the world — but not in the pejorative sense. They feel like very kind and human instruction manuals. And I have a lot of affection for instruction manuals. Philippa Raynsworth, Molesworth’s protagonist in Philippa, is a clear-headed, strong-willed girl in the nicest way possible. Her older sister Evelyn Headfort is lovely and charming, but a little nervous and easily led. 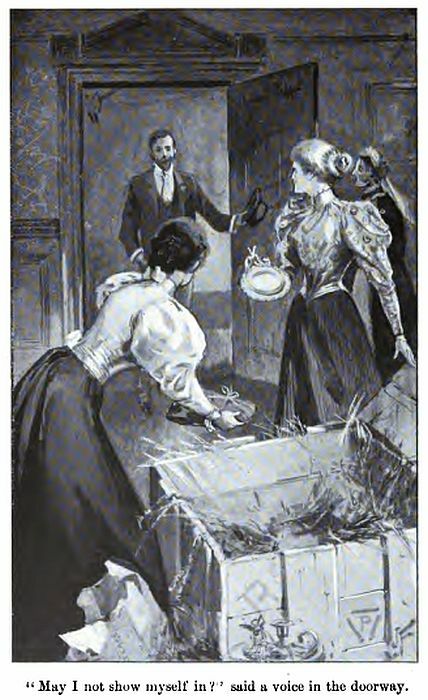 So when Evelyn is invited to visit her husband’s relatives for the first time, and the Raynsworths can’t afford to send a maid with her, Philippa disguises herself and accompanies Evelyn to Wyverston, the Headfort estate. This is a colossally reckless thing to do. One of the things I love about Mrs. Molesworth is that when her heroines have adventures, everyone around them is always like, “Excuse me, you did what?” Evelyn is easily bullied into letting Philippa come along, and Philippa really is helpful to her, but their parents are pretty upset, and Philippa herself soon realizes that this masquerade could have serious consequences. Enter the Gresham cousins. Bernard is a wealthy, attractive young man who Philippa met at a cousin’s house, and who happens to be staying at Wyverston at the same time as Evelyn. Uglier, poorer dog-owner Michael travels to Wyverston in the same second-class train compartment as Philippa, and soon sees that there is a mystery about Mrs. Headfort’s maid. Either cousin could expose Philippa and destroy Evelyn and her husband’s relationship with the Wyverston Headforts — and permanently damage Philippa’s reputation. And if things weren’t complicated enough, Evelyn strongly suspects that Bernard Gresham was attracted to Philippa when he met her before. But this is all very dramatic, and that’s not where Mrs. Molesworth lives. The masquerade is soon over, but Philippa still has to deal with the consequences, which include her shaken self-confidence, the strain of keeping a big secret, and the strong possibility that she’s going to have to meet some of the Wyverston guests again. Philippa is a girl who does the right thing, but sometimes it’s hard to figure out what that is, and even when her path is clear it’s not always a fun one to follow. Her experiences force her to grow up in a way that she might never have to if she wasn’t so sensitive and scrupulous. I just…really think Mrs. Molesworth is great. She’s so restrained. There’s so much she doesn’t fully explain, and it’s all because she doesn’t really have to. I love an author who can leave things unsaid but understood. I’m mostly thinking of the romance plot here, and I probably shouldn’t be so wary of talking about it. It’s pretty clear who Philippa is going to end up with. But the way it plays out is satisfyingly slow, and so understated that the final part doesn’t even happen on-page. I don’t want to interfere with that slow unfolding, because I really do recommend Philippa. It’s not the best book ever, but I can’t think of a single thing that’s actively wrong with it. Well, I haven’t read any Mrs. Molesworth, but I have been thinking about it for a while. Looks like I may have found my way in. This is definitely a good one to start with. Grim House is another one I’d recommend. Yes! I love how Molesworth’s older-girl stories can have main characters doing occasionally-not-bright things, and the results can be mixed, rather than This Thing Was Clearly The Right Thing To Do Even Though Unconventional Because Everything Turned Out Perfectly vs. Every Last Shred of This Thing Came Out Badly So Obviously You Shouldn’t Do Unconventional Things, which are the more normal plot concepts. Yes — she allows so much nuance. Not just in the plots, but in everyone’s feelings. It’s great. I probably haven’t read enough of her fantasy books to have formed a real opinion, but I wonder if I would have appreciated them more as a kid. I think my main frustration is that they aren’t much fun. And fun isn’t what I go to Mrs. Molesworth for, but it is something I want at least a little of from children’s fantasy. I was actually super impressed with the one non-fantasy, aimed-at-small-children Molesworth I read: Rosy is about a small girl with a bad temper and while I felt at times like I was being scolded directly…the scolding was valid? I have never heard of Mrs. Molesworth but this sounds like a book I would enjoy, even though I mostly stick with American authors. I have read some L.T. Meade, and I’m kind of mixed on her books. L.T. Meade is one of the most inconsistent authors I know, but even her best books aren’t as good as most of the ones I’ve read by Mrs. Molesworth. I think the Mrs. Molesworth books I most recommend are this and The Grim House.